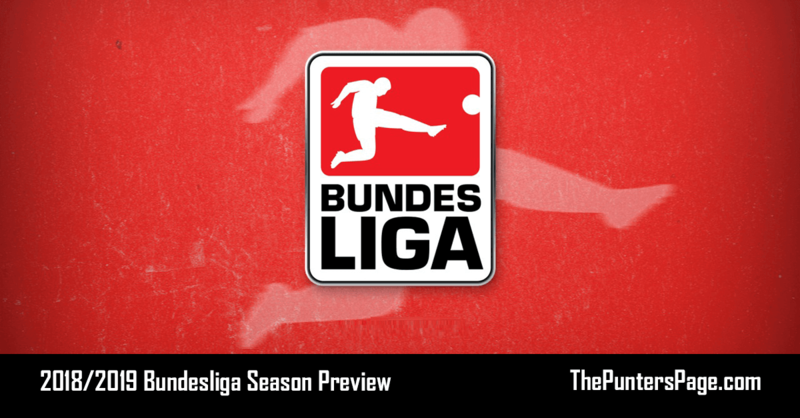 Football specialist Sam Langston (@Samlan98) provides us with an in-depth betting preview of the 2018/2019 Bundesliga season with a focus on the outright, relegation and top goalscorer markets and pens his best bets. 1/6 shots to win a seventh consecutive top tier title, Bayern Munich are unsurprisingly the short-priced favourites in this market. As such, rather than focusing my attention on the Bavarian big-guns’ well-known qualities, I have formulated this article based upon finding value in the outrights. Two bets take my fancy as I preview this season’s Bundesliga. Priced as the three front-runners to claim top four spots, Bayern Munich (1/100), Borussia Dortmund (1/5), and RB Leipzig (8/11) hold little appeal at their odds-on quotes. Next in this market are Bayer Leverkusen and Schalke (11/10), whilst last term’s surprise package, Hoffenheim, are 11/4 outsiders. Despite previously achieving a second placed finish, xPoints positioned Schalke as the fourth best performers. With a -11.31 differential compared to their end-of-season tally, Die Königsblauen were the biggest overachievers in the Bundesliga. In contrast, showing a +6.54 differential to their actual points accrued, Bayer Leverkusen were unfortunate to finish fifth according to xPoints. Only inferior to Bayern Munich and Borussia Dortmund in this metric, they accumulated the third highest xG sum and second lowest xGA. Only goal difference denied Die Werkself a top four place last season, and given the current prices, they are value ahead of their competitors. Boss Heiko Herrlich has completed some shrewd dealings this summer, most notably managing to retain star man Leon Bailey. Crucially, the Jamaican-born trickster has penned a new five-year deal at Leverkusen, and his involvement will be key in a potential Champions League challenge. Yielding a £19m profit following Arsenal’s swoop for Bernd Leno, the free capture of Lukáš Hrádecký’s is also excellent business. After cementing himself at Eintracht Frankfurt as one of the Bundesliga’s best stoppers, the experienced Fin is a bargain for Bayer. Hrádecký’s acquisition has been followed by two other savvy signings, who will further strengthen Die Werkself in wide areas. £16.65m has been splashed out on 18-year-old Brazilian ace Paulinho, who will join Kai Havertz, Julian Brandt, Leon Bailey, Lucas Alario, and Kevin Volland to make for a potent array of attackers. Mitchell Weiser has also been snatched up from Hertha Berlin and is an ideal replacement for wantaway right-back Benjamin Henrichs. A stronger squad is possessed by Heiko Herrlich this campaign and this stands them in good stead to secure a top four finish. Odds-on (4/5) to face the drop this season, Fortuna Düsseldorf are priced as outright favourites for relegation. Suggesting a 55.6% chance of a return to the second tier, the heavy favouritism attached to Flingeraner is evident. The 2. Bundesliga champions are followed in the market by fellow newcomers Nürnberg, whose relegation price tag (11/10) implies a 47.6% probability. However, when observing historical data associated with Bundesliga newcomers, trends suggest we should oppose such short-priced punts. Data accounting for the last 25 seasons shows that 20 (80%) 2. Bundesliga champions stayed up the following year. 47 out of 68 promoted sides (69.1%) avoided immediate relegation, including all six who survived in the previous three campaigns. With this indicating little value is held by the market leaders, the smart approach here is to take on the bigger prices. After swerving the relegation play-off last term, Mainz appeal at a healthy 5/2. The 05ers finished 14th in the Bundesliga, just three points away from the two-legged tiebreaker. Evidently, offensively orientated weaknesses were Die Nullfünfer’s downfall, having accumulated the lowest xG total (31.65) out of the 34 participants. Yunus Malli was the last Mainz player to register a double-figure goals count, and with a proven top tier striker still absent from Sandro Schwarz’s squad, there is little to suggest this two-season trend will be broken. Top scorer Yoshinori Muto has recently left the club for Newcastle, and despite a far from prolific record, his departure is a blow. Summer signing Jean-Philippe Mateta is an exciting young starlet, but the 21-year old French forward lacks experience at this level. Impressively, he bagged 17 goals in Ligue 2 for Le Havre last season, but the transition to the Bundesliga is likely to take time. There will certainly be a reliance on the young striker’s shoulders, but whether he can hit the ground running remains to be seen. With the 05ers set to struggle offensively, they must be difficult to break down and possess a resilient rear-guard. Versatile defender Moussa Niakhaté has been snatched up from Metz and will fill the vacant left centre-half slot, playing beside captain Stefan Bell. However, following Abdou Diallo’s big money move to Borussia Dortmund, the 22-year-old Frenchman has big boots to fill. France U21 skipper Diallo was Mainz’s man mountain last campaign and his absence could prove to be significant come May. Considering all aspects of the above, the 5/2 on Sandro Schwarz’s side to be relegated appears good value.